18 December 1944. The Philippine Sea. 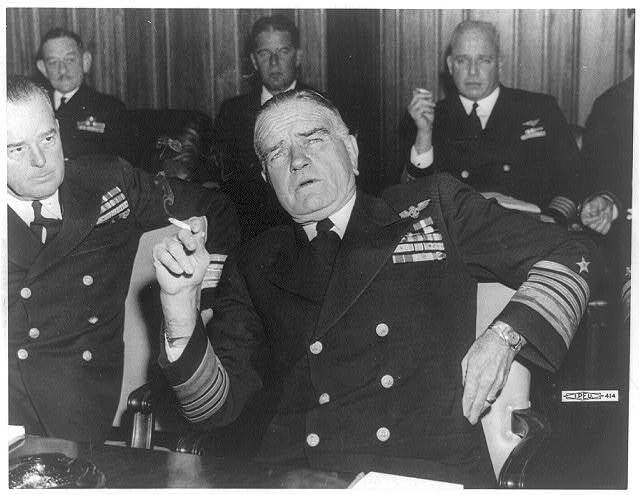 Under Admiral William “Bull” Halsey Task Force 38 steamed for a rendezvous point where they would meet up with Task Force 30.8 (refueling) and Task Force 30.7 (anti-submarine “guard” for TF 30.8). TF 38 would refuel before returning to the Philippines to assist General Douglas MacArthur. Swirling over the sea, something was taking shape. It was thought that whatever it was, it would head in another direction—away from TF 38. On December 17 the weather began kicking up. Winds would later reach speeds of over 100 mph while large waves washed over decks. Ships were tossed around like toothpicks. At the time task forces didn’t know they were sailing straight into a typhoon. To complicate matters some vessels were running very low on fuel and riding high in the water. When the three groups arrived at the rendezvous point the troubles were only just beginning. In attempts to refuel ships, the vessels threatened to collide. The crews on the oilers took their lives into their own hands while trying to carry out their duties. Finally the task had to be dropped and a new rendezvous point named. For some ships it looked hopeless. It was feared they would run out of fuel before they had a chance to take on more. In moving to a new rendezvous point Halsey thought he was avoiding the storm. He was in fact sailing one step ahead of it and Typhoon Cobra was racing to catch up with the fleet. It didn’t take long for accident reports to start pouring in. Near collisions, planes and men washed overboard, planes breaking loose and crashing in ships causing fires, ships suffering power problems. And of course the usual flying silverware and being tossed from bunks proved a little troublesome thanks to rolling. Night was a long time in coming and then a long time in ending. It was nearly impossible to get any sleep. Even strapping oneself onto a bunk didn’t guarantee sleep. In the midst of this Halsey was also concerned about a possible enemy attack. Their rendezvous was taking them close to Japanese held territory and he feared they might attack while the vessels refueled. If they refueled. Throughout the night Halsey and other officers stayed awake aboard the USS New Jersey as they tried to evaluate their precarious situation. December 17 turned into another day. 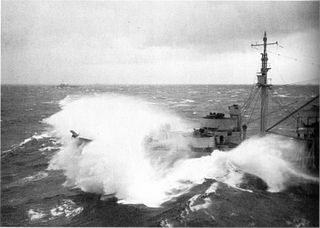 In the midst of the typhoon acts of heroism were being acted out all over the fleet. The USS Monaghan was pitching ferociously and lacking sufficient ballast. Right before attempts were made to correct the lack of ballast, the Monaghan began to “die”. A distress call was sent out before communications failed. From there on out the Monaghan was literally being beat to pieces. And she was powerless to do anything. When she finally began the sinking process many sailors who went overboard were crushed against the ship. Aboard the USS Hull, the generally disliked Lt. Comdr. James Marks was also having a rough go of it. Reportedly Marks was unable to carry out his duties and his crew was getting fed up with him. Morale low and the end appearing imminent sailors prayed and wrote what they thought would be their last letters. By 11 a.m. of December 18 there had been a great deal of damage done and sailors had been washed overboard. One angry sailor suggested to the second-in-command that he take over the Hull . The officer considered that mutiny and ignored the suggestion. It didn’t take long for sailors to accept the fact that the Hull was going to sink. Although earlier Marks wouldn’t hear anything of it (he feared panic) some of the crewmen had already strapped on their kapoks (of if they were less fortunate, old Mae Wests). Then the Hull capsized. On the USS Spence bulkheads were collapsing. Because she was taking on so much water her captain, James Andrea, had to form a bucket brigade. But after so long the stalwart vessel could take no more. Andrea radioed about their condition adding “We can’t make it.” Another officer, Lt. (junior grade) Alphonso Krachunas was nearly decapitated by an airborne whaleboat. The crew was no doubt caught off guard when the Spence finally flipped over on her side. Panicked sailors rushed to get out of the ship before she sunk beneath the waves. When Krachunas made it into the sea he found himself admiring the red anti-fouling paint covering the ship’s keel. The USS Tabberer under Lt. Comdr. Henry Plage had gone missing from the fleet, TF 38 learned. Not wanting to risk a collision Plage had changed course. Then at 6:18 p.m. the Tabby lost her main mast. With it went the radar and antennae. Communications had just gone up in smoke. Ralph Tucker was able to rig up an emergency antenna which allowed for very short range transmission. It was while working on the antenna he thought he seen someone out in the water. With the alert of a man overboard the Tabby turned around to investigate. A man was indeed spotted and successfully rescued. He later identified himself as a survivor of the Hull. With news of Hull’s loss (it would be hours before Halsey learned of his three ships losses) Plage immediately began rescue operations. A number of survivors were located. Sometimes the swimmers would be too weak to haul themselves in so a sailors would be dispatched from the Tabby to bring them in. In the water, sailors from all three lost ships were having a rough go of it. The rafts and nets they sought shelter on were thrown up and down by the waves, spilling the occupants. The men would then have to make their way back onto the nets only to be tossed off again. Their numbers quickly dwindled thanks to the elements, wounds incurred in the sinkings, sharks and barracudas. Disappointment came in the form of planes and ships passing through who didn’t see the survivors. Others would notice ships conducting box searches and stay put knowing the rescuers would reach the survivors soon enough. For some soon enough wasn’t quick enough as there were quite a few men who died before rescue. Other vessels managed to retrieve survivors but the Tabberer took on the most with 55 in all; the men hailed from the Hull and the Spence. The last of the survivors were picked up after having been stranded in the water for three days. Many survivors suffered grievous injuries, but were treated as best as possible. In the end approximately 790 men had been lost in the wake of what was to be called “Halsey’s Typhoon”. Source: Drury, Bob and Tom Clavin. Halsey’s Typhoon. I read that blog off and on but hadn’t seen this particular post. Will go off to read it! No, I can’t imagine it. It’s the stuff nightmares are made up of. Such horrifying experiences the survivors had to witness. Needless to say, they all came home uneaten. So much for my phobia! I’ll try to keep the gory details to a minimum. I’m not looking forward to that bit. The only thing I’d really heard about Halsey was in the movie Hunt for Red October. I should probably expand my reading a bit. Go for it! 🙂 I think you would find Halsey an interesting part of history. “The Admirals” by Walter Borneman is an excellent look at Nimitz, Halsey, Leahy, and King and he covers both of Halsey’s experiences with Typhoons in WW2. It’s one of the best books I’ve read lately. Thanks for another gripping post! Great post from my friend J.G. I can’t imagine the disappointment of seeing planes go by and not being rescued. As always, a great story. Excellent post as usual, and new things for me to learn. I’m in possession of a replica model of the USS Hull 350. This model was made on the ship by crew members and gifted to the Ships Captain. Any one with more information on this matter please contact me at my email address. This replica is made of wood not made of plastic. Thank You. How interesting, Judy! I hope someone will be able to help you out.